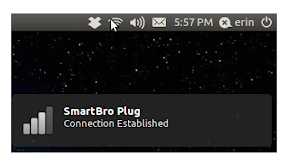 This guide is created to show how to use the SmartBro USB Internet dongle in Ubuntu Linux. 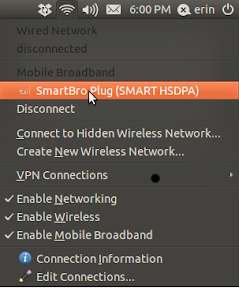 The dongle comes with the Windows installer that enables the SmartBro application to be installed in most computers. 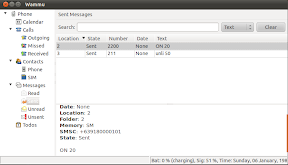 From within that application the user is able to send and reeive SMS, and connect/disconnect their Internet subscription. It allows more operations like access to the Smart portal but for the duration of this guide only the SMS send/receive and Internet configuration is covered. The instructions should be portable to the plug-it kits of the other telcos. 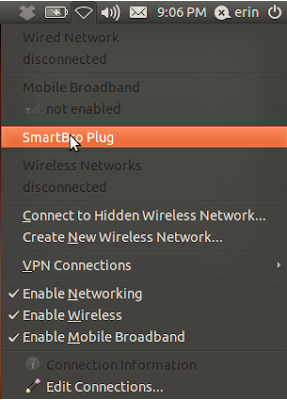 From my experience, Ubuntu has easily supported the USB dongles and tethering devices as early as Karmic Koala. I no longer have my Sony Ericsson K618i that I just connect via a USB cable to my MSI Wind U100 Netbook so this is what I will use for the guide. My netbook is sporting Natty Narwhal during the time the screenshots are taken. Lets get cracking. Caveat though that I had to recreate some activities in two different locations so don’t mind the clock too much. Boot into Ubuntu and connect the dongle. Wait for a few second while the system recognizes the device. 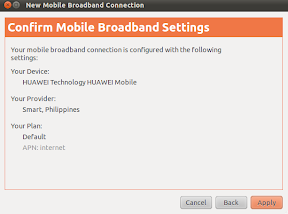 From the system tray, click on the network-manager applet and enable the “Enable Mobile Broadband” option. 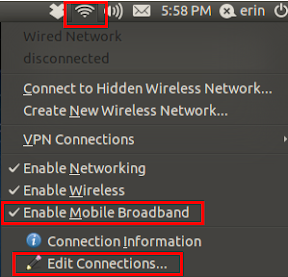 Select the “Edit Connections…” entry, and add a new entry under the “Mobile Broadband” tab. 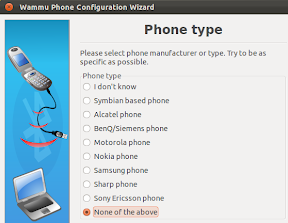 As can be seen below, Ubuntu has already detected the chipset of the USB dongle. Click on the Forward button. 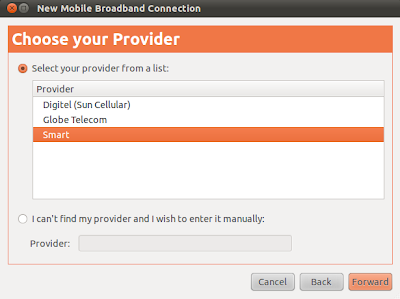 Select the provider (which in this case is Smart). Click on the Forward button. 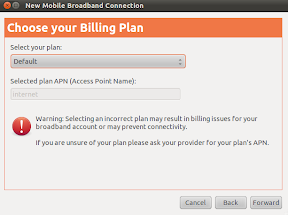 On the billing plan dialog, accept the default selection and click on the Forward button. Confirm the summary of the selected settings by clicking the Apply button. 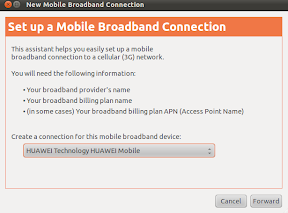 Visit back the settings of the created connection and ensure that there is no username and password in the Mobile Broadband settings page. Save any changes made and dismiss the wizard to go back to the desktop. 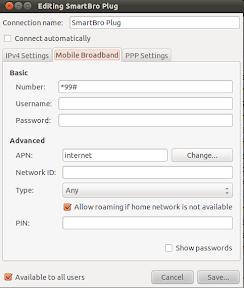 Click on the network-manager applet and click on the mobile internet entry created above. If everything goes well and the signal is strong enough the user should be greeted with an established connection message. Click on the network-manager to validate the type of connection. The setup above can fail if the SIM card used is of the prepaid type and there is no credit loaded on the account. SMART imposes a Php10/30mins rate but there are promos that can be activated by sending some keywords via the SIM account. This implies that the SMS send and received facility should be accessed. Fortunately the wammu project provides this capability. Start the wammu application. If the wammu application doesn’t find its configuration files then it will trigger a wizard for first time-configuration. The above part is trial and error. If the test doesn’t succeed select the next option. If it succeeds then information about the model of the dongle will be shown. In my experience it is almost always /dev/ttyUSB0 but then I do have another device that emulates a serial connection via USB. – Complete the remainder of the next dialog windows using the default option. 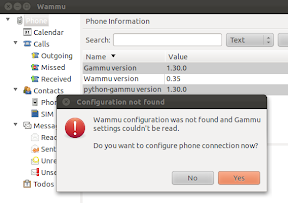 Once the wammu phone configuration is done, start accessing the USB dongle by invoking the Phone->Connect menu item. 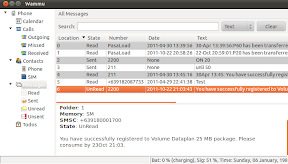 Once the dongle is active, test the connectivity by receiving existing messages. 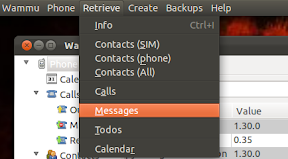 After the operation succesfully completes, select the Messages item in the left treebox to view all retrieved messages. 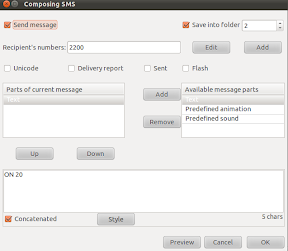 Next is to try the SMS sending capability under the Create menu. The editor is dated compared to the built-in provider interface but it would suffice. In the screenshot below, the bucket promo of Always On is being triggered. Check the Sent folder if the message was successfully sent. After a few seconds/minutes, retrieve the messages again to check the result of the promo registration.